Drug of Abuse (DOA) testing is the clinical detection of one or more drugs within the human system, by sample testing. This is done to provide clinical intervention or for monitoring of illegal drug intake. Global DOA testing market was poised at USD 4,938.6 million in 2017. The testing for DOA requires products such as immunoassay analyzers, chromatography instruments, breath analyzers, rapid test kits, and assay kits & reagents. The rapid test kits are driving the growth of the DOA testing market and are the estimated to hold the largest share in 2017. Among the various products being used in DOA testing, the rapid test kits forms the largest contributor to the industry. This category high demand is due to the easy availability and access for on the spot drug testing. The rapid test kits as per its name also presents output in short time thereby has higher demand in comparison to the other product category. However, the breath analyzers are estimated to grow at a fast rate with a CAGR of 9.7% during the forecast period. The DOA tests make use of human samples such as urine, saliva, hair, and others. Urine is majorly used for drug of abuse testing, since it contains parent drugs or metabolites in them, that is tested for the presence of major illicit drugs. The urine samples lead the global DOA testing market based on size. Some of the other sample type used includes blood, tissue, and sweat. Hospitals are the major share holder based on end user in DOA testing market, and is also estimated to retain the largest market size during the forecast period. The category’s large size is due to the increasing number of research and drug test being conducted. The hospitals account to hold high number of tests due to the availability of products on a large scale as compared to other end users of DOA testing. Also, the presence of number of clinicians in hospitals is larger, marking its large share over others. Further, diagnostic laboratories, on-the-spot testing, forensic laboratories, and others such as academic institutes. A growing trend witnessed by the DOA testing market is that leading players are enhancing their product portfolio through addition of products and updating of software with new substances for DOA testing, in order to maintain their competency and market share. For example, in February 2018, Shimadzu Corporation released its Smart Forensic database Ver. 2, with features for analysis of forensic toxicological substances involved in DOA in biological samples by using Gas Chromatograph-Mass Spectrometry. In November 2017, Thermo Fisher Scientific Inc. updated its library for the Thermo Scientific TruNarc handheld narcotics analyzer. The update added 45 new substances that included 14 new forms of fentanyl to handheld narcotics analyzer, and it can now detect Carfentanil. The increase in production, consumption and trade for new and illicit drugs will lead to high demand of DOA testing that will drive the growth of industry. According to the World Drug Report 2017 by UNODC, the annual prevalence of all illicit drug use is 5.3% with 255 million numbers of users in 2015. This will necessitate the need for DOA testing and will thereby drive the growth of the market. The government initiatives to raise awareness against DOA and rise in organizational compliance for DOA testing will render to the growth of the overall market. The high demand of products with increased specificity and sensitivity towards designer drugs will also add to the growth of the industry. The number of suppliers in the DOA testing market is high, however the products utilized in DOA testing needs to follow stringent government regulations, the threat of forward integration is low leading to a moderate bargaining power of suppliers in the market. Geographically, North America account for the largest share in the DOA testing market, globally. This contribution is due to the adaptation of technologically advanced products for DOA testing, increased demand for illicit drugs in the region, large scale drug trafficking, and the increasing government initiative to spread awareness against DOA. Moreover, the DOA testing industry is expected to be witness fastest growth in Asia-Pacific. 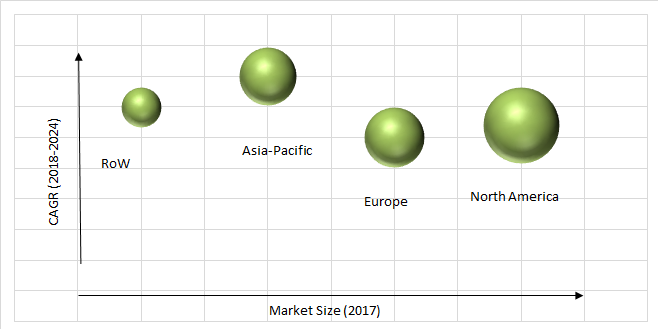 The major player in the global DOA testing market include Danaher Corporation, Siemens AG, Merck KGaA, Drägerwerk AG & Co. KGaA, bioMérieux S.A., Waters Corporation, Roche Holding AG, Quest Diagnostics Inc., Laboratory Corporation of America Holdings, Alere Inc., Abbott Laboratories, ThermoFisher Scientific Inc., Express Diagnostics Int'l, Inc., Randox Laboratories Ltd., Psychemedics Corporation, Bio-Rad Laboratories, Inc., and Sonic Healthcare Ltd. The leading players through acquisitions are attaining competency and larger market share in the global DOA testing industry. For example in January 2018, ACM Global Laboratories, an affiliate of Rochester Regional Health announced the strategic acquisition of DrugScan, Inc. and DSI Medical Services, Inc. The acquisition was made to establish laboratory service portfolio and drug testing capabilities. 9.5. Express Diagnostics Int'l, Inc.
Table 47 Snapshot – Alma Lasers Ltd.
Table 48 Snapshot – Express Diagnostics Int'l, Inc.
Table 49 Snapshot – Hologic Inc.
Table 51 Snapshot – bioMérieux S.A.
Table 52 Snapshot – Quest Diagnostics Inc.
Table 54 Snapshot – Alere Inc.
Table 54 Snapshot – Bio-Rad Laboratories, Inc.